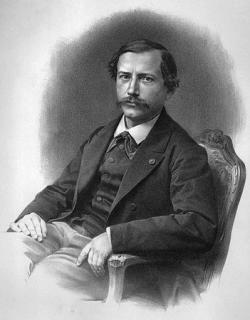 Pierre-Eugène-Marcellin Berthelot's 19th-century quest to create lab-grown food. “The epicure of the future [will] dine upon artificial meat, artificial flour, and artificial vegetables,” and enjoy the delights of “artificial” wines, liquors, and tobacco. Berthelot conceded that the manufacture of steaks and bacon would not be easy, but dismissed the obstacles as nothing more than “chemical problems.” He predicted that artificial meat would be delivered in the form of easy-to-swallow tablets in “any color and shape” that a gourmand desired (tablets, in his view, being an improvement over the original: “the beefsteak of to-day is not the most perfect of pictures in either color or composition.”). To naysayers, Berthelot pointed out that making steak in a lab was simply an extension of the progress humans had devised for centuries on end. Electricity, for example, had replaced open flame. “Chemistry has furnished the utensils, it has prepared the foods, and now it only remains for chemistry to make the foods themselves,” he argued. Marcellin Berthelot fashioned his vision of science and sweetness at a moment that many at the time regarded as a watershed in human history. In the 1890s, the world’s nations battled for control of dwindling global resources. Famines raged in India, Russia, and other parts of the world. Global population surged to new heights but so, too, did the number of humans living in cities, and as everyone knew, city folks relied on others to grow food on their behalf, and farmers worldwide struggled to keep up with demand. In the United States, then as now the world’s foodbasket, politicians, economists, and do-gooders bemoaned the crude state of American agriculture. Many people favored reorganizing farming so that it mimicked the factory, the better to supply the world’s foods. So it’s not surprising that as the 19th century gave way to the 20th, food was viewed universally as a crucial component of nation building, as important as navies, guns, and bullets. Common theory linked food to national power and racial superiority: The quality and quantity of a nation’s diet predicted whether it would dominate or be dominated. In Europe, Great Britain, and the United States, scientists like Berthelot raced to unravel the components of foodstuffs, obsessed with extracting every ounce of nutriment from every inch of soil or, better yet, from every test tube and microscope. Of all the foods, meat reigned supreme. According to long-standing and widely shared theory, meat both denoted and endowed national power. Meat-rich diets had made Europeans and Americans masters of the planet, while “rice-eating” Japanese, Chinese, and “Hindoos,” as one typical essay phrased it, were an “inoffensive” collection of people from whom not much could be expected. So meat there must be, if not from the farm then from the lab. “A lump of coal, a glass of water, and a whiff of atmosphere contained all the nutritive elements” of both bread and beefsteak, one writer observed in 1907. Science only needed to unravel the equation that would turn matter into meat. Many applauded in 1912, when Jean Effront, a Belgian chemist, announced that he’d manufactured “artificial meat” from brewery and distillery wastes. Effront washed and compressed the wastes and doused them with sulfuric acid, rested the mixture a few days, and then added lime to neutralize the acid. Once the liquids evaporated: Voila! A product that contained the same “albuminous elements” as were produced in the human body by digested meat, but with three times the nutritional value of beef. Physicians who tested Effront’s Viandine, as he dubbed it, pronounced it “superior to beef.” Laboratory rats and an undernourished Belgian “workman” both gained weight and good health while eating it. And so the world turns. More or less. More than a century after professor Berthelot waxed rhapsodic about meat from the lab, we humans face our own watershed moment. Is there sufficient food for the future? Is a meat-centric diet viable in a resource-scarce and environmentally fragile world? Even assuming that professor Post can figure out how to mass produce petri dish burger, will people eat it? Or will this project go the way of, say, Golden Rice, a genetically modified rice designed to prevent blindness among malnourished children? Will we citizens of the 21st century, like those a century ago, place our faith in science? Or will we demand solutions to hunger that look to the past rather than science for inspiration—small, local, natural? Only time will tell, but this much is sure: When it comes to food, and especially meat, there’s not much new under the sun. This post originally appeared on Maureen Ogle’s website. Her latest book, In Meat We Trust: An Unexpected History of Carnivore America, will be published by Houghton Mifflin Harcourt in November.